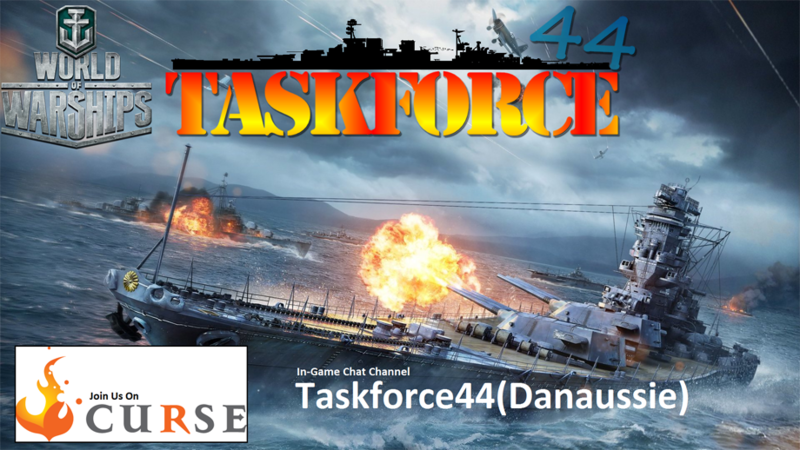 Taskforce44 for WoWs is a player club aimed at Australian & New Zealand English speaking players as a meeting place for club activities and announcements. Taskforce44 was initiated through the Official World of Warships Asia forums as a means by which Australian & New Zealand (English speaking) players could meet up with other players from our region and play group games and have regular club meetings. In a game, such as this it can almost be advantageous for players to function as a group, and it is by this understanding that the club has been formed. The Asia WoWs server has players both from the Asia & Australasia regions all playing together which is fine except for the obvious language barrier which can make it almost impossible to coordinate attacks during game play. Taskforce44 has been initiated so that we can provide a club in which English speaking Australian and New Zealand players can meet up regularly at times that best suit the players from our particular region of the World and form divisions for game play. The Taskforce44 HQ Fleet Command Centre is a hub for which our members can communicate, meet and greet and discuss matters or opinions relating to the club and the game. However members should be reminded and are urged to utilise the Official World of Warships Asia Forums for any and all other information related to the game, such information will not be provided for players here. Regular updates will be made in relation to Taskforce44 meetings so be sure to check in on a regular basis in case meeting times or other relevant information should change for any reason. Want to Join Taskforce44 - Sign Up Here!!! Members & Guests Please take the time to read the Taskforce44 Mission Statement & Policy regarding the creation and maintenance of our Fun, Friendly & Welcoming environment. A place for Taskforce44 members to make general announcements on Taskforce44 meetings and other general information relating to the club. A place for Taskforce44 members to meet and greet with other players and chat about matters relating to the club and game. A place for players from Taskforce44 to talk about the game. Team Battle Chat, Tactics & Strategy. An Archive of old competitions that we may wish to activate or use again later. A place for players to talk about topics that are unrelated to the game.